I have used a charcoal smoker for many yrs. with great results . It is now to far gone to save . I am wanting to go with either propane or electric for my next smoker . Mostly will be using it for Venison Jerky , Snack Stix , Sausages , and some fish . Pros / Cons for either would be greatly appreciated . Masterbuilt 40" Electric Smoker with Window love it for 8 months now and saw Frank at LMA telling me about his too, you will love it and not too pricey. Second that. I have had mine for 3 years and love it. Set the temp and forget about for the next couple of hours. I do fish, ribs and brisket mainly. Electric is the only way to go. Set the temperature,set the time, and do what ever else you need to do. Tried them all over the years and the new electric smokers are great. I have the all black Masterbuilt without the window and it works great. Funny this topic came up. I'm switching from years of charcoal driven to the Master built 40" electric. Way to easy and less $$$$ in the long run! Same here but it's also the first smoker I've ever used. Having the window would be nice...but using the thing very easy as is. So far, my favorite has been smoked venison tenderloin. Sausages are also excellent and, believe it or not, so are smoked vegetables. I have a Master Built Propane - Love it... I had an electric smoker years ago and the only issue was when it was cold outside it did not generate enough heat. My guess is they are better now but this is my experience. I still have a cheap Brinkman charcoal smoker and I can't quit it. Went fishing and had a drink or went drinking and caught a fish? Itch , I too used the Brinkman charcoal Smoker . It is just rusted away to nothing , over the yrs . I'm looking for an easier , more user friendly setup , before I buy something . Ive been lookin at the Smokers at BPS for a while now . I'm gonna get somethin . Just not sure what , yet . I'm thinking the ,, Elec ,,, just makes sence . I have never used an electric or propane smoker, I understand how it could be nice to maintain heat and eliminate the fluctuations you may get with coal. There is something primal that I like about using a charcoal smoker. I only use my smoker about 10 times a year for fish (which are generally easy to smoke), so I may be in a different league of smoking. Now if you are doing brisket, I can see where the reliable temperature control would be easier with electric and gas. I have my charcoal smoker figured out for fish...I load it with lump charcoal and get it blazed, toss in some soaked hickory chunks...then throw on a second batch of wood in an hour. in about 3.5 hours I have 2 smoked kings. Have a three year old electric Smoke Hollow Smoker. 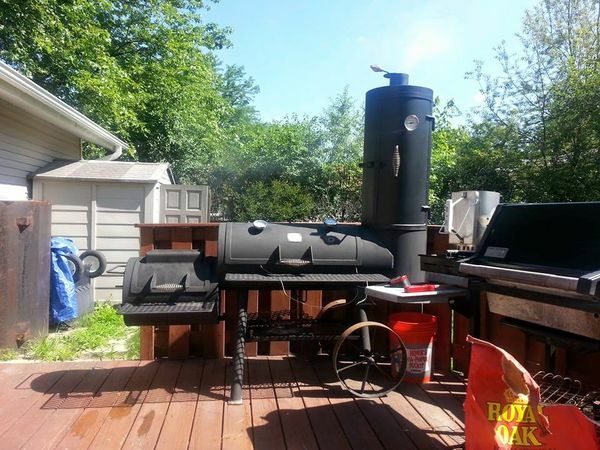 It has smoked ribs, turkeys, bacon, fish, pork shoulders to perfection. Easy to use. But still always keep an eye on the temp. Habit I guess. The thing is it is rusting away. I keep in the garage when not in use. Looking for a new one in stainless steel. Anybody have an suggestions on a great brand. That will last? I know it has been a while since I have posted. There are pros and cons of every smoker. At the same time there are hacks to every smoker to limit the difference. This is what I currently run, I also have the gas conversion for it, and in addition IF I want to "cold smoke" and go electric then I have a hack for that, I picked up a 10 dollar hot plate from savers....you know the ones look like a single electric stove top coil, that and a cast iron pan to put the wood into and BAM you are cold smoking, good for cheese, lox, fish,jerky and eggs. the off the shelf electrics are sort of like RONCO you set it and forget it, stay away from any that take special "wood fuel" like pellets or biscuits as these can be costly. Gas do well, tend to give better flavor than electric, and are also portable, camping, cook outs etc no need for a cord. Charcoal is the original way and kind of the purist, you will achieve the most flavor, but is also the most labor intensive. All in all just remember your food will only taste as good as what you cook with, I personally have a supplier for my lump charcoal and restaurant grade wood. P.S. the Royal Oak is not my supplier, I have a deck box that I keep all my wood and charcoals in, it was removed to gain access to the others. I went from a rusted out Bradley to a smokedaddy pellet pro 2 years ago. Love it. Uses wood pellets with an electric auger to feed fire box. The control unit works great. I use it year round. Have run it when its less than 10 outside and it's held temp surprisingly well +/- 5 degree consistently. They also have kits for converting 55 gallon drums, old refrigerators and other brand smokers to pellet style. Also works differently than but well as a regular grill. It's all about the fun! If you can't laugh at yourself, we'll do it for you. For me, the electric smoker is the way to go. Chitown-Angler was started on February 10, 2003 and has received 207587503 page views in total since that date.